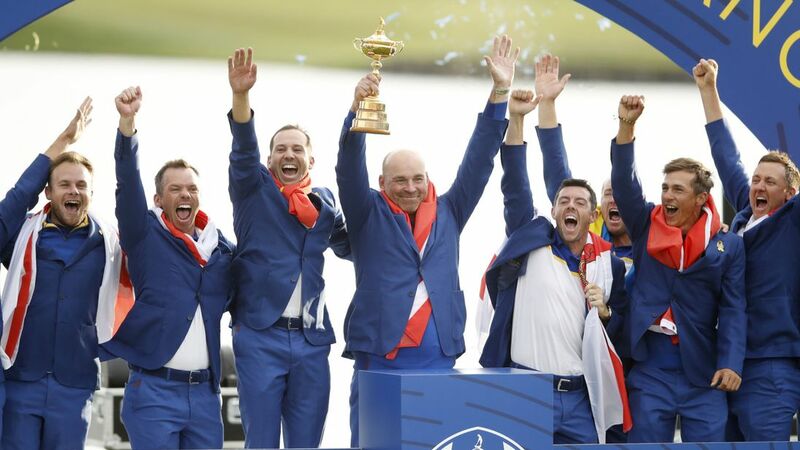 Europe's golfers have won back the Ryder Cup after beating the US team 17.5-10.5 at the Golf National course near Paris. Italian Francesco Molinari, who became the first European player to contribute a maximum five points from his five matches, sealed the victory. His four and two win over Phil Mickelson meant Europe had an unassailable 14.5 points, guaranteeing they would regain the trophy the US team captured in 2016. Reigning Open champion Molinari said it meant everything to him: "So much, so much more than majors, more than anything. It's been an incredible week. Obviously they had probably the strongest team ever and were just so good." Moments earlier, Europe's Ryder Cup talisman, Ian Poulter, had beaten Dustin Johnson, the world number one, leaving captain Thomas Bjorn's team poised for victory after an early American fightback. Known as 'the postman' because he always delivers, Poulter later got into a pillar box costume as the team's celebrations got properly underway. Trailing 10-6 coming into Sunday's final-day singles, the USA got the perfect start when Justin Thomas took the first match by beating Rory McIllroy on the 18th hole to reduce the deficit to three points. When Webb Simpson defeated Justin Rose and Tony Finau thrashed Tommy Fleetwood, the deficit stood at just one point, but that was as good as it got for the US team as the holders failed to hold their nerve, allowing Europe to fight back. Wins for Spanish rookie Jon Rahm over Tiger Woods and for Poulter and Molinari in their matches handed the cup back to Europe, which has dominated the competition this century. "It's the best feeling of my life," said Rahm, whose win meant the US legend did not contribute a single point in a grim return to the competition for the first time since 2012. Woods, who often cut a disconsolate figure on the course, said: "I'm one of the contributing factors to why we lost the Cup, and it's not a lot of fun." Woods's fellow US veteran, Phil Mickelson, performed just as badly, setting an unwanted record as he lost for the 22nd time in the Ryder Cup.